A traditional lamp with a black base and pewter stem and shade holder featuring our top down warming technology, now comes assembled in the box. Includes warming bulb and frosted white shade. 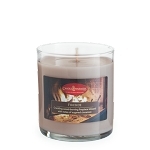 Place your favorite candle inside and enjoy the warm glow. Box Dimensions- W 8.5" x D 6.3" x H 10.9"